The purpose of this website is to publish a History of Scottish Stock Car Racing principally in the form of a record of all the results, together with a limited accompanying narrative on each year and a few photographs. I have accumulated a large archive of data over the years in the form of programmes, driver’s letters, magazines, meeting attendances, newspaper publications and discussions with promoters and drivers. For some considerable time I felt that this information should be collated and made available for reference. The Updates Tab at the top will advise when future and current updates are or will be made. From the pre Spedeworth years such as F2 drivers George MacMillan Snr, Ian McClelland, Les Clark, Tiger Thomson, Albert Wardle, Walter Brown. The early Saloon Stocks men - Howie Jarman, Basher Forrest, Jack Keeton and those that moved on to other formulae Ronnie Nisbet, Les Kay, Dougie Farrer & Kenny Ireland. 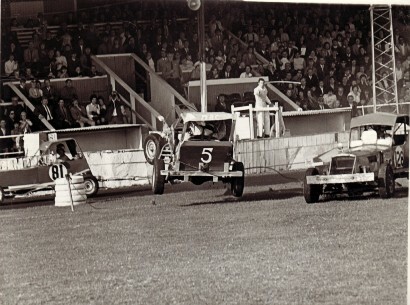 The Superstox pilots Vic Russell, Bill Pullar and Malcolm Paterson. The F2 era from 1981 onwards - Gordon McDougall, Jimmy Moodie, Jimmy Wallace, Ally King, George MacMillan Jnr, John Fortune, Stuart Gilchrist, Chris Burgoyne and finally a candidate for Scotland’s best ever Gordon Moodie. The Superstox men who made the successful transition to F2 on Spedeworth Scotland’s closure, Jim Harris and of course the irrespressable Les Clark again. 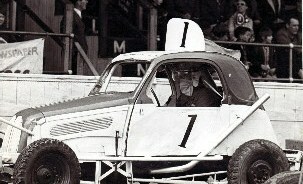 Les was racing at Glasgow’s White City in 1963. He won multitudes of Superstox honours over his long career and then won the Scottish F2 points championship in 1992, almost 30 years later - a true great. Scotland has produced a wealth of the UK’s top Saloon Stock drivers, from Hamish Buchanan, Charlie Milne, Robert Bruce, Colin Noble, Bob Jones, Keith Jarman, Harry & Ernie Burgoyne, Gordon Alexander, Kenny Purdie, to Stuart Sheville Jnr. 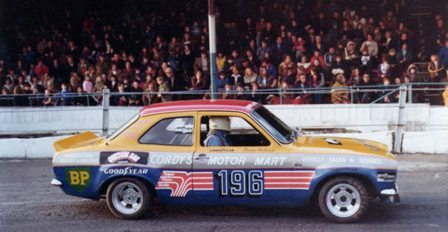 Then we come to the Hot Rods, what can you say about Scottish Hot Rod Racing?, certainly a victim of the shape of the Cowdenbeath track, the appalling treatment of the NHRPA from time to time and dead end specifications? Notwithstanding this, some excellent action has been provided in Scotland and some creditable performances away from home. The drivers who have dominated the class Les Kay, Kenny Ireland, Davey Philp, Paul Wightman, Ian McGuigan and Colin Gammack are a credit to the sport. This website then will record all of these great drivers’ achievements, but more than this, to record all of the drivers who have competed, some in 100’s of meetings, some suffering terrible damage, working all hours to be ready for the next meeting, all for little reward. Whether they have scored 0 points or 10000 points, the aim is to record them all here, to ensure they are not forgotton. Of particular assistance in the accumulation of this material have been Gordon McDougall and Ian Fraser they have supplied me with masses of information and photographs over the years, initially in my capacity as Scottish contributor to “Short Circuit” magazine and in later years simply through my continued interest in the sport. Gordon’s intense involvement in Stock Car Racing in Scotland is unrivalled, spanning almost 50 years, commencing his career as a Formula 2 competitor in 1966 at the age of 20 and then as a promoter and competitor in 1981. Ian Fraser the Sports Editor with the Edinburgh Evening News from 1966 to 1996. Both Ian and The Edinburgh Evening News are long time supporters of Scottish Stock Car Racing and right from the start of Spedeworth Scotland’s promotion have provided rich written commentary. 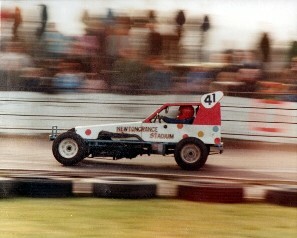 Ian also spread the word of Scottish Stock Car racing in a multitude of other publications over the years. I have decided to commence the publication of this data on the internet with the decade 1970 through to 1979. The main reason for this, is that I have a reasonably comprehensive archive of data over this period, with most meeting results completed. Also if I endeavoured to include all the history prior to listing, the time necessary to execute this would mean that it would probably not appear for another 5 years! The update tab at the top of the page will advise when additional content has been incorporated. Unfortunately as you progress back in time the information I have accumulated is less complete, however I am hopeful that the posting of this web site will help uncover more of the earlier information which will allow the site to be updated and be more comprehensive. Now that this first decade is posted the intention is to update as often as other commitments allow. I was originally hopeful of adding years on a monthly basis, adding a year at a time, commencing with 1980, then 1969, 1981, 1968 and so on. This was an ambition which turned out to be extremely optimistic! Any additional data or narrative that is accrued over time relating to the years already listed will be added as it becomes available. It is acknowledged that there will be multiple errors in the data published. This is due to a number of reasons such as results that have been recorded in programmes often varying from programme to programme, but mostly though, due to incorrect input from me. However over time the site will be updated and content corrected where corroboration is acquired. 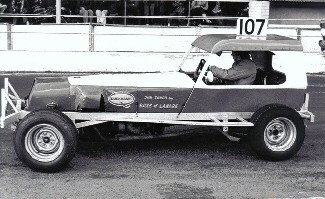 I would be interested to hear any information on early Stock Car Racing in Scotland, from those first meetings in 1954 on July 16th at Motherwell, and July 31st at Edinburgh, through the meetings at Steppes Stadium in Glasgow, Coatbridge, Carntyne, and White City Stadium Glasgow and so on. Any information that is missing or to corroborate data I have posted would be appreciated, whether it is drivers newsletters from promoters (a great source of information), programmes, magazines, newspaper cuttings etc. My records on Crimmond are a bit sparse but I have been promised content and will include that when it becomes available. 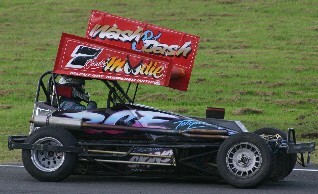 The results section comprises a comprehensive record of all meetings, including points acquired and drivers competing. Finally, as I have noted earlier I have received a vast number of photographs from Gordon McDougall and Ian Fraser over the years which had been provided to them in turn for promotional purposes, I have also taken many thousands of photographs myself and acquired many others from various other sources. 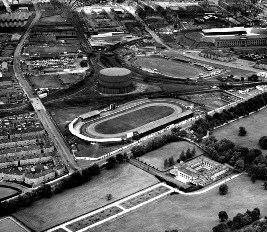 Although the website only has a limited number of photographs, the bulk of the images were taken by the brilliant Cowdenbeath track photographer Jim Fyffe. GM Photos then took over the publishing rights of these photographs. Sadly Jim & Gordon (GM Photos) have both passed away. At this time unfortunately I cannot direct anyone as to where they may be able to obtain copies of Jim's photos. Credit for unknown source or misidentified source photgraphs please contact me. I hope this accumulation of information will provide some interest, I have certainly enjoyed putting it together.